A sensitively compiled celebration of the neglected discipline of street photography, it gives credence to some of South Africa's photographers – such as Ronald Ngilima, Sukdeo Bobson Mohanlal and Daniel Morolong – who aspired to, but never did make it to the photographic gallery circuit, but instead grew a clientele and mostly made a living. Many of them are no longer alive, but the grace and dignity of their work holds tight. Printed up, often from found negatives after the demise of an urban photo studio, the works, some of which draw from private collections – including those of Angus Gibson and Ruth Sack – are modest in size and call for intimacy in your gaze. With a spot of anthropology and a flash of history, these photographs attest to humanity. They're formally posed photographs of men and women who are anonymous, but who are also everyman. Almost family "snaps" but for their formality, these photos feature an array of costumes, reflecting on the basic nature of street photography, which burgeoned from the 1930s and gained some institutional recognition in 1978. Photographs from 'The Other Camera'. When a young adult moved from the rural environment to find a job in the big city, armed with scant education, poor English, a dearth of opportunity and a sociopolitical ethos that crushed them on sight, if they found a job, it would be menial. But to their family back home, these were truths not to be shared. The facility of the photo studio was such that, for a few bucks, the mineworker or domestic worker, the garbage collector or municipal toilet cleaner could put on the necessary bling to make their loved ones on the other end of the posted photographs believe the rosy sheen of their described future. It's a classic tale of immigrants: less than crude fantasy, these were gestures about history and self–esteem; the fierce hope in each of these hand–picked works speaks clearly. With some airbrushing and photo–montage, these works present a wise take on nostalgia around the dying traditions of manual photography, involving dark rooms and film, know–how and straightforward camera mechanics; traditions that have lost momentum in the digital age of the citizen photographer. 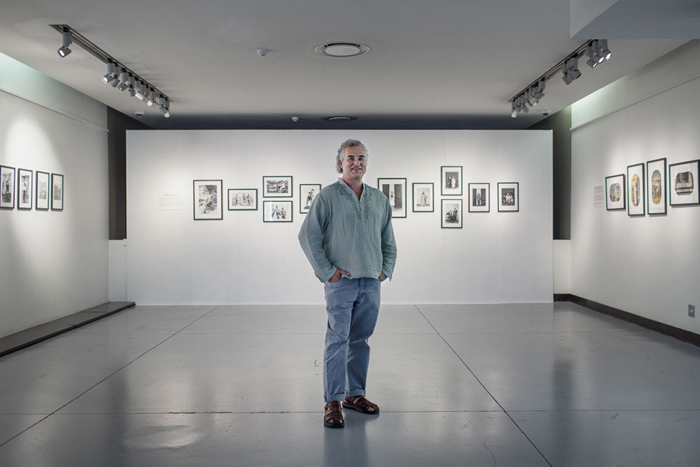 The exhibition casts a photographic nod at the founding fathers of the field, who took the initiative from the 1980s to train young black people as photographers – David Goldblatt, Dave Southwood and Weinberg himself. Paul Weinberg. Image by Gustav Butlex. There is one female street photographer: Lindeka Qampi, a woman who has raised four children on her photographic beat. Her images are bold and smile-inducing. There's a sense of schlock in how she celebrates the contradictions in urban reality, but she skirts from cliché — cleanly. In this exhibition Qampi is honoured in a bigger way than through her photographs alone: in the gallery's far corner, there is a mock–up installation of a street photographer's studio, called Lindeka's Studio. It's replete with crudely designed vinyl flooring, a red curtain as backdrop and a variety of clothes to dress up in. And there's a photographer waiting for you to pose. This is the exhibition's fun part: it's handled to rhyme with the work's dynamics, never cheapening it, but burnishing it memorably: as you pout at the photographer, having donned someone else's sunglasses and pretend to blow on a yellow vuvuzela, you realise the magic in this humble gesture. And you understand these images' power. And some more goose bumps rise on your skin and in your sensibilities. Story by Robyn Sassen. This story first appeared in the Mail & Guardian on 25 February 2015. Slideshow courtesy of the Mail & Guardian. 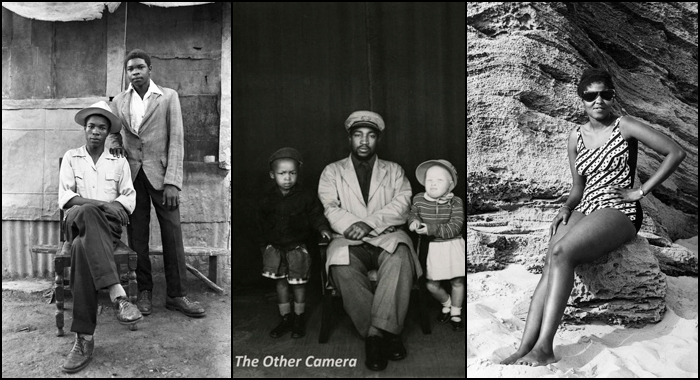 The exhibition 'The Other Camera' ran at the Origins Centre gallery in Braamfontein, Johannesburg, in March 2015 but you can still see many of the images in the slideshow at the top of this story, together with a narrative by Paul Weinberg. Read more stories like this by subscribing to the UCT's monthly newsletter. View the newsletter in which this article appeared.